John Jay began to inherit his land near Bedford, New York in 1785, three years after his father died. The land here had been part of 5200 acres that had been owned by Jay’s maternal grandfather, Jacobus Van Cortlandt. Jay inherited 287 acres here in 1785, and another 316½ contiguous acres two years later when an aunt died. He began developing the land as an income-producing farm in 1787, strictly as an investment at first. He developed it further in the late 1790s, to become his home in retirement. His descendants lived here all the way into the 1950s, and as you walk around the property, you will see many features developed by the different generations of the Jay family. 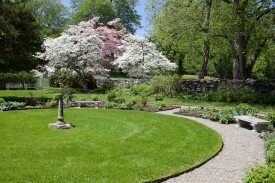 Click HERE for our self-guided landscape tour booklet. The Brick Cottage was constructed in 1800-1801 to become the farm manager’s house after Jay decided to move here and enlarge the existing farm manager’s home to serve as his own. John Jay wrote to his son Peter in January of 1799, outlining the design, and even some of the construction details, of the house. In late August of the following year, Jay reported that the house would be completed “in about a Fortnight.” The house served as a farm manager’s residence for most of the next 140 years. It has been altered and enlarged several times. When the Iselin family was having the main house enlarged in the 1920s, the family temporarily lived here. The building is now closed and awaiting interior restoration. Construction of the Carriage Barn began in June 1801 and was completed in 1802. At that point, it consisted only of the part with the stone and mortar ground story. Double doors were put on the south wall to admit carriages; another set of doors on the north wall opened onto the courtyard, so the horses could be taken to stables in the lower story of the coachman’s house across the way. The large, central area of the carriage barn was meant for storing vehicles. On the sides of this area were much narrower spaces whose original purpose is not documented, but which likely contained more stables for horses, and storage areas for tack and other supplies. The building underwent repairs and alterations as the years went on. Sometime by 1908, the most extensive change was made when a large wooden shed was built onto the north side. With its wide sliding doors and concrete floor, it was constructed to garage the automobiles of Arthur and Eleanor Jay Iselin. The foundation of this barn is the oldest structure that survives at John Jay Homestead: the stone walls were built in 1787. 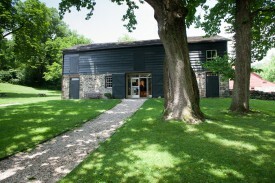 The wooden part of the barn was rebuilt by John Jay’s son William in the 1830s. It was originally a multi-purpose structure for housing livestock, threshing grain and storage. Nineteenth century modifications include a silo on the north end, which was demolished in 1917, and an addition on the east, which still stands. This portion served as a dairy until 1922 and thereafter as storage space for old carriages. Today it houses an exhibit on farming and one of our Discovery Centers. Now a stone foundation, the cow barn was built in the early 1830s. A tool shed was added to the southwest corner in 1917; other alterations to the barn were made in 1922 for the building to function as a dairy. A ramp for getting the cattle up into the building and the foundation of a silo are also still visible. The hog shed was built in the late 19th or early 20th, adjacent to the south poultry house. Only the foundation remains today. An ice house was constructed along the east side of the draft horse barn in about 1900. Its foundation is still visible today. This barn is associated with the farm’s expansion in the late 19th century during John Jay II’s residency. According to family traditions, the barn housed draft horses that were used to plow fields and haul heavy loads. This building was constructed as the Jay family’s laundry around 1885. Its interior has been remodeled to provide public restrooms. 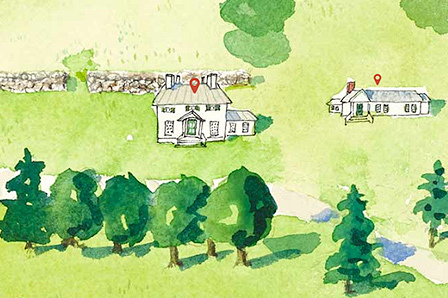 The Coachman’s House was another of the buildings built about 1800-1802 by John Jay. Originally the coachman lived above the stable in one end of the upper floor, with the remainder of the top floor used as a hayloft. The ground floor was originally open, with bays for carriage horses. The stone ends contained storage rooms for tack. The lower section was enclosed in the 1850s. This building currently serves as the office for Friends of John Jay Homestead. This building was built in 1918 to house a carpenter’s shop above, and for garaging the Iselin family’s automobiles below. It currently serves as housing for staff. When the family of Eleanor Jay Iselin decided to take up residence in the Brick Cottage during renovations to the main house, their farm manager was going to need a place to live, so the Iselins built this house for him and his family. It was prefabricated, and was likely ordered from the mail-order company, Montgomery Ward, in 1922. Today, it is used for equipment storage. No longer extant, the Horse Barn was built in the late 19th century. Flat stones that are set into the earth, where the wooden posts that supported the barn were located, are still visible today. A farm inventory taken in 1912 lists equipment, wagons, and farm animals housed in this barn and its attached sheds. Large concrete foundations are all that remain of four poultry houses. In the 1930s, this was mainly an egg farm; the Jays also grew potatoes and raised ducks at that time. Today, InterGenerate manages a chicken and egg cooperative with 40 heritage breed chickens. Built c. 1891, this building continues to house a pump for the well that delivers water to the Homestead. Hidden in the woods adjacent to the staff parking lot and historic laundry is the foundation of a sheep barn built in 1922. The foundation next to the small parking lot servicing the coachman’s house office of Friends of John Jay Homestead was a wagon shed built sometime in the early to mid-19th century. During the 18th and 19th century, stone walls were typical throughout eastern New York State and New England, and gave the landscape a distinctive character and compartmentalization. 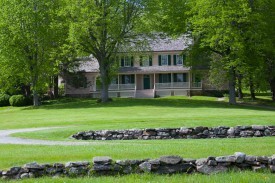 The earliest referenced stone fences at the Homestead appear in a 1794 letter from John Jay to his tenant, Samuel Lyon. The large field south of the Maple Allée was where itinerant brick makers, hired by John Jay, made bricks for construction of the Brick Cottage and the main house. Archeologists have found evidence of clay pits, brick rubble, and the probable foundations of a kiln in this field. Later this field was used as meadow and pasture land. The field is currently used for special events and programs, and an apiary is located in the southeast corner. This area is part of the Spruce Brook, which ultimately drains into the Cross River Reservoir. An area was dug out of the land around it, the brook was dammed up, and the dig filled with water. The water is very calm, with little current. During the winter, this would allow the surface of the pond to freeze relatively deeply. The ice would be sawn into sections joined to make ice blocks, and kept in an insulated ice house. By this period, trains had come in, and tin milk jugs would be loaded onto box cars with the ice blocks for shipment to New York City. The enormous trees here lined an estate drive, creating a spectacular canopy for the carriages that brought the Jays and their guests to the main house. The beech trees were planted in the mid-19th century by John Jay’s grandson, John Jay II. The beech allée connects to the original circular drive in front of the main house. The land just beyond the allée was sold by the family in the mid-20th century; it is now privately owned. The road that leads south from the Homestead’s farm complex to Route 22 was called the Farm Road. Some of the trees you see there are the remnant of a row of horse chestnut trees planted before 1821 by John Jay’s son, William. William’s son, John Jay II, planted elm trees among the horse chestnuts later in the 19th century. The 9 ½ foot tall brick piers at the foot of the road are identical to the entrance for Lyon Ridge Road, which had at one time been the original entrance to John Jay’s Bedford home. The Maple Allée, which intersects with the Farm Road by the brick cottage, was planted sometime in the 19th century. It used to extend to Maple Avenue, which meets Route 22 a little further down the street. These two roads were the main way into and out of the principal part of the Jay farm. The lot bordered by the brick cottage and prefabricated house on the south and the cow barn and carpenter’s shop / garage on the west was historically referred to as the “old orchard.” Rusticus Garden Club has replanted part of this lot with a new orchard. The trees are heritage breeds of apples and pears that are known to have been grown here by John Jay. The long lilac hedge along the main entrance drive dates from the mid-19th century. The row of linden trees in front of the house is the only area of planting at the Homestead we can attribute to John Jay. At the home in Rye where he grew up, there was a row of four locust trees in front of the house. Jay liked the effect, and when he moved to Bedford, he planted a row of four linden trees there. None of those trees are still alive; these three are what remains of four that were planted by Jay’s descendants to replace the trees he had planted long ago. The large tree by the carriage barn is a cucumber magnolia; it is believed to be the largest example of its kind in the region. A ha-ha is an earthen barriers designed to keep the sheep from getting too near the family’s house; the sheep couldn’t jump high enough to get over them. From the house, the ha-ha would be almost invisible, so the sheep were kept at a distance while the view was of an almost unbroken expanse of lawn. The dropped area between was the location of an oxcart road, which, like the ha-ha, was meant to be partially hidden from the view from the house. It connected to the original entrance drive on its northwest end. The flat area behind the playhouse was a grass tennis court in the early 20th century, but in John Jay’s time, this area was part of a large pear orchard that extended to the west. Archeological excavation revealed that the base of the tennis court was constructed by placing layers of cinders and coal ash, items in plentiful supply as waste from the Homestead’s heating system, over a layer of rock and sand.